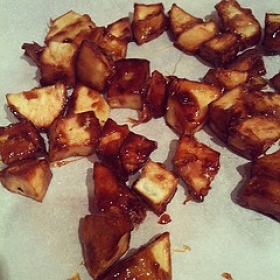 Have you made Candied Sweet Potatoes Family Recipe? 1. 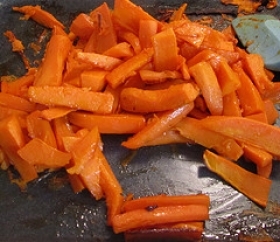 Cook sweet potatoes in boiling water 20-25 minutes or until fork-tender. 2. 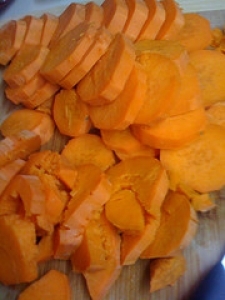 Let cool to touch; peel and cut potatoes lengthwise into 1/4-inch slices. 3. Set aside. 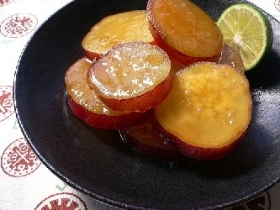 Combine brown sugar and next 5 ingredients in a saucepan; stir in pineapple juice, syrup, orange juice and butter. 4. Cook over medium heat about 10 minutes, stirring occasionally. 5. 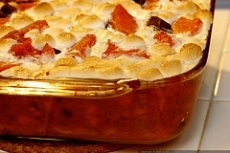 Place half the sweet potatoes in a lightly greased 13x9x2-inch baking dish. 6. 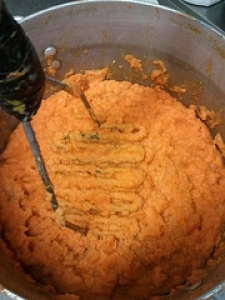 Pour half the sugar mixture over sweet potatoes; repeat layers. 7. Sprinkle with pecans. 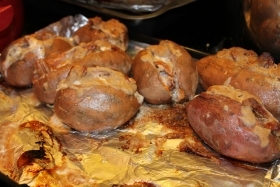 Bake at 350 degrees for 30 minutes or until bubbly. This recipe contains potential food allergens and will effect people with Wheat, Pineapple, Butter, Gluten, Potato, Corn, Natural Sweeteners, Fructose Malabsorption, Pecan, Oranges allergies.